My name is Lily Blin (née Fenner) and I was born in 1933 in Newhaven. 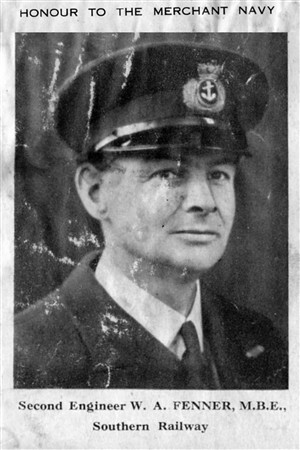 My father, Walter A. Fenner worked as a marine engineer on the Newhaven Dieppe run, and on hospital ships throughout the war. He was decorated 1942. He married my mother, SUZANNE LECUL, in Saint-Nicolas, near Dieppe in 1932. I now live in Canada which is a long way away!. I have recently been writing a sort of memoir and I wrote this piece called “LOOKING BACK”. I include a part which refers back to Newhaven. “At times, I saw the little girl that I had once been, the little girl who had sat by her bed-room window in a house high up on the hill on Mount Pleasant, Newhaven. It was her favourite place in the house. From there she gazed out over the back gardens at the green double deck buses winding along the coastal road, her eyes drifting over to the swampy fields where she caught minnows, and beyond them to her favourite view of all, the harbour, the jetty, and the sea leading to France and her beloved French grand-parents. She never tired of the sights and sounds of the ships coming in and out of the harbour. Her favourite days were the ones when the whole scene disappeared in thick, dense sea fog bathing everything in an aura of mystery. The eerie sound of the fog horn answering the ship’s horn as it tried to bring her father’s ship safely into the harbour wafted up to her bedroom. She loved the storms with the waves hurtling themselves against and over the jetty, the strong iodine smell of seaweed on the rocks, as she inhaled the sea air, breathing it in deep into her lungs. Every two days she said good bye to her father, handsome in his navy uniform and of whom she was so proud. He worked as a marine engineer, crossing the sea between England and France. “I shall miss you” he always said as he kissed her good bye. Her arms encircled his neck. She never wanted him to leave. Her bed-room had been decorated by him. It was very special. Her bed - a ship’s bunk in beautiful dark reddish brown wood, with 4 large drawers underneath - had been rescued from a defunct ship . On the walls, a yellow wallpaper, covered in wild animals - lions, zebras, elephants - so that every night she dreamed that she was sailing on the high seas to exotic lands. But during the day, this small room enveloped her in a womb like feeling of safety. From inside this wonderful world of her bedroom, she could look out onto the outer world with no fear. She was unaware that very soon, her world and indeed the whole world would come crashing down. But that summer, that hot summer before the Second World War, she spent as always with her grand-parents in Saint-Nicolas. She was 5 years old. Too soon however, the carefree days of that idyllic summer came to an end. On the 3rd September 1939, war was declared. The Second World War had started. Her life, that of her parents, and indeed of the world changed for ever. Her father’s ship, immediately transformed into a hospital ship, did not go back to Dieppe until 18th May 1940. He would try his hardest to get his wife, child, and parents-in-law back to England, but, already embarked, the family would experience the bombing of the Dieppe harbour and would be unable to get back to England. 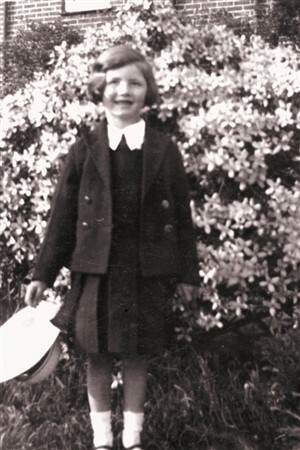 That little girl would experience the strafing of the masses of people fleeing the German army in fear on the roads; the invasion; internment for a while in a concentration camp in France; the death of all her grand-parents and above all separation from her father for the next five years, whom she would not recognise when she finally met up with him again at the end of the war. This page was added by Lily Blin on 18/09/2011. Hi Lily, Lovely story, I was a messenger boy at the Marine Office in 1945, remember your father's name mentioned a lot. My mother was delighted to find your name come up on here. I had just met a couple on Falmouth seafront in Cornwall and mentioned Sussex. He asked me where and when I said Newhaven, remarkably he said he had been born there. Anyway, after a long conversation, he said I should look on this website and came home, got the laptop out with my mother alongside. Mum had just said "look and see if you can find the name Fenner" and then I came across this article. My mother's name is Janet Davis and she says she is absolutely delighted to find your name and story on there. She seems to recall that you did a secretarial course and that you used to meet on the train to London where she trained as a radiographer. She also wonders what happened to Madeleine Burt and hopes you may know. She still hears of Janet Knight and her sister Barbara. She says she is going to bed delighted to have heard of you in this way! or Jane.Barrett@rcht.cornwall.nhs.uk I wonder if I may have inadvertently put a mixture of the two addresses! It's almost midnight and I've just discovered this messaged response. Just told mum and she is very excited by it. She says to tell Lily that her uncle (by marriage of her aunt) Wilfred (Wilf) Baker often spoke of Lily's father. Wilf worked in the marine workshops at Newhaven. Hi Lily, I am not 100% sure at this stage, but I think your father's family may be in my family tree, was your father (Walter Fenner) born in Newhaven 1901? Were his parents Thomas and Edith? Richard (Editor): Lily we do not normally publish e-mail addresses, but I have sent Mrs Swann's address to you personally.